One of our favorite childhood Christmas traditions was enjoying the delicious and beautiful shortbread cookies my Mom made. She would put the light dough through a star-shaped cookie press and add a tiny piece of maraschino cherry in the center of those beautiful stars. I set about coming up with a version of Mom’s recipe that was faster to put together without sacrificing the flavor and delicious aroma while it baked and this food processor “bar” version is the result. These bars aren’t as meltingly light as Mom’s cookies but they are delicious. It’s important to measure the flour correctly as you would when making bread. Fluff the flour first then spoon lightly into the measuring cup and sweep off the excess. 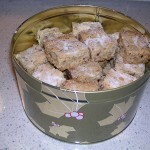 If you scoop from the flour bin, you will get too much and the shortbread will taste too floury. When the shortbread comes out of the oven and while it is still hot, use a sharp knife to cut the shortbread into bars or squares. I use my cooling rack held in place on top of the baking pan as a guide to get straight lines. The shortbread is very rich so I cut mine into about 1 1/2-inch pieces. I hope you enjoy this Christmas treat! Place flour, cornstarch and brown sugar in food processor workbowl. Process until well combined. If you’re making my favorite Cranberry-Orange version, grate the orange zest into the workbowl. Put the Craisins into a small bowl and separate so they aren’t in clumps; toss with about 1 tsp flour just to coat. Add them to the workbowl. When butter is melted, add the vanilla and stir to combine. Turn on the processor and gently pour the melted butter/vanilla mixture through the feed-tube. Process just until the dough holds together. Turn dough into an ungreased 8-inch square pan and gently press into an even layer with a spatula. Don’t worry about making it smooth, it will come together as it bakes. Bake for about 50 minutes until golden, taking care corners do not burn. 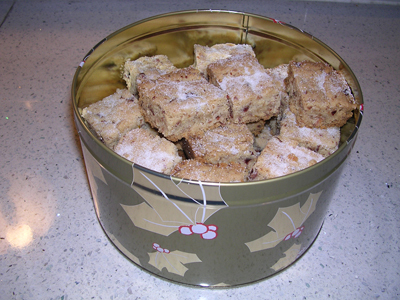 Place on a cooling rack and while still hot use a sharp knife to cut into squares or bars. Prick the top of each piece lightly with a fork then sprinkle very lightly with granulated sugar. Allow to cool, then remove from the pan and store in an air-tight tin. Can be frozen. Categories: Recipes & Food | 0 comments yet, your thoughts are welcome!